When I visited the Sussex County Master Gardeners’ Open House in July, I spent some extra time in their Children’s Garden. A new grandmother, I am looking for ideas to captivate my grandson when he comes down to visit! I am looking forward to toddling around the garden with him, exploring the sights, aromas and textures of plants. I came across a plant called the Shrimp flower. 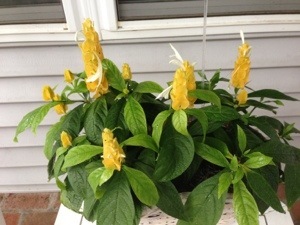 In Delaware, it is treated as an annual, but it also does well as a house plant. I was captivated by its pale-orange panicles, which are actually bracts, and whispy white plumes that sprout ever-so delicately from the top. What a perfect choice for a children’s garden, because they are so interesting to look at. And why just for children? I must confess, that as I have moved more toward perennial plants in my garden, my choices for annuals (mostly used in containers) has become somewhat predictable…geraniums, impatients, marigolds, zinnias. It’s time to spice things up! I shared my delight with Jay Windsor, a retired UD Extension agent in horticulture, and now a fixture at most volunteer Master Gardener events. Jay has a plant outlet in Lewes, a florist business, Windsor’s, in Rehoboth and commercial greenhouses in Laurel. I asked him if he sold these, as I don’t recall ever seeing them in his store. Jay answered that yes he did, but they were probably out by July. I made a mental note to go early next year and grab some up. As I have claimed in many posts, gardeners are some of the most generous people on earth! Imagine my surprise when a few days after the open house, this basket of shrimp flowers arrived at my door! Although they do well in the ground in sunny locations, this was just too pretty to plant, and they enjoy a central spot on my front porch! I plan to add many more next year. I think they will be a terrific addition as I transition my garden plan to a “George Harrison” theme!